I had a comment from Andi. "I'm still very confused about the point of Itte son Kakugawari Senpo; if it's so good to have the rook pawn back on the 4th rank, why can't white just skip this move in the normal development and then be the first to attack?" 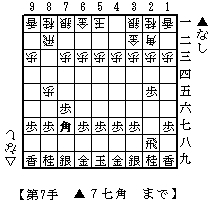 In the normal Kakugawari opening, Bishop exchange occurs on the square of 7g after Sente wastes one Bishop move to 7g, while it occurs on the square of 8h without Sente's wasting any Bishop move in the Itte son Kakugawari opening. Sente's B-7g is not necessary unless Gote pushes its Rook pawn to 8e intending to exchange its Rook Pawn. This is why Gote cannot keep its Rook Pawn in the 4th rank in the normal Kakugawari opening.. 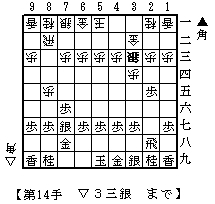 In other words, unless Gote pushes its Rook Pawn to 8e, it will not be able to go to the normal Kakugawari opening. Gote's right kNight cannot jump to 8e in the middlegame in the normal Kakugawari since its Rook Pawn is already on the square of 8e. Itte son Kakugawari opening will allow Gote to jump its right kNight to 8e much more easily to threat to capture Sente's Silver on 7g in the middlegame. If you are further interested in the difference between the normal Kakugawari and Itte son Kakugawari, please visit the following two links to to the pages of Chidori Gin no Senpo Zukan(in Japanese) and replay the sequences using Kifu for Java there. Although the comments are written in Japanese, I think you have no problem to replay the sequences. ps: now that I read through it, I realize in my proposed variation, white could of course ALSO keep his rook pawn back :) As I say, confusion reigns, but by writing it down a little bit of it seems to disappear... it's like shogi-therapy!